Hi.... remember me? I leave food things here sometimes for other people to look at. I'm sorry I've been away so long. Things have been pretty crazy the last few weeks / months, and I feel like I've had no time to get on top of things. Two days after we came back from the Saveur Awards in Charleston (which were amazing, and my best girl Kate totally KILLED it, PLUS we got to meet Becky! It was the best weekend ever), I headed off to San Francisco for another five days of working on something secret one of my lovely foodie friends is currently crushing. We managed to narrowly avoid the awful fires there, which began the day before we left, and were uncomfortably close to where we were staying. I flew back on a terrible flight, then promptly got a hideous cold, which threw a large spanner in the works in terms of getting things done before we headed off to Amsterdam last Sunday! We stayed with some friends for a few days, biking all around the city, and spending time at all their favourite spots rather than hitting up all of the tourist traps. It's my favourite way to see a city : through the eyes of one of my friends. We drank amazing coffee, hung out in parks, and made epic gouda mac and cheese. It was perfect. I am now in an air bnb in Paris (!!! ), surrounded by more friends. We have spent the last few days eating all the pain au chocolat we can get our hands on, more picnics, and traipsing all over the city, photo bombing obnoxious tourist photos, and checking out the sights of the city. It has been the best, and I'm going to be so gutted to say goodbye to them all on Tuesday. For someone who spends a lot of time hanging out at home by myself, it has definitely been an overwhelming amount of travel. I think I made five trips in six weeks, with only a few days back home between each one. It's been amazing, but I am so, SO ready to be back home for an extended period of time. Being away for a while makes you miss everything. I have a zillion recipe ideas in my head, and I can't wait to start making all of them, not to mention baking from some amazing books that have shown up at my house recently! One of the things that I did have time to throw together in one of my couple-of-days-at-home stints were these dessert cups! This week is the #virtualpumpkinparty, where a load of us bloggers are all coming together to share our favourite pumpkin recipes! Thanks so much to the lovely Sara for organising - you can find a full list of the participants on her page! I wanted to keep things pretty simple, and share an idea i've been working on for a while. I was originally going to make some sort of super fancy custard cake like this one i've been drooling over for ages, but when it came down to it, I simply ran out of time to fiddle around with ring molds and acetate, so jammed all of the components into a jar, and came up with this dessert jar! Dessert jars are perfect for a party or dinner, or for having on hand in the fridge if you need a wee sweet treat (me, always). All of the components can be prepared in advance, meaning that there is minimal work when it comes to serving - you just have to assemble a few things, top them with cream and pecan brittle, and you are good to go. I started with a spiced shortbread base, spiced with all of the pumpkin spice flavours - cinnamon, nutmeg, allspice and ginger. The shortbread is whizzed up with a little butter, packed into the jars to form a base, then topped with a creamy pumpkin custard. The dessert jar is then topped off with a scoop of lightly whipped cream, delicately flavoured with maple and vanilla bean. The whole thing is then garnished with a sprinkling of a super simple maple pecan brittle. It may seem like a load of work, but almost all of the components are prepared well ahead of time. In my opinion, these make the perfect autumn dessert. If you are a little short on time you could most definitely use a graham cracker base - it would cut out the shortbread step, and still be just as delicious. I used canned pumpkin puree because I was short on time. Usually in the past I have made my own, but to be honest I didn't taste that much of a difference. If you aren't somewhere where you can get canned puree (aka anywhere that isn't North America), you can definitely make your own! Graham crackers would work well as a base if you don't want to make the shortbread! I used an immersion blender to help blend up the custard before I strained it, as pumpkin can sometimes be a little fibrous. If you don't have one, you can skip this step - it's not crucial, but it does help to make it nice and creamy. If you are preparing these ahead of time, you can layer in the base and custard, then add the cream and pecan brittle just before whipping - freshly whipped cream only takes a minute or two and tastes so much better fresh! I've done the measurements for the custard and shortbread in grams because it allows me to be a lot more accurate when adding things like egg yolks, which can vary a lot in size and therefore throw off your ratios. If you don't have a scale, get yourself a cheapie! I made these in small weck jars, which hold 160 ml or 5.4 oz, but small mason jars or any other small jar you have should work perfectly! This recipe can easily be scaled if you were making for a crowd! If you do up-scale the recipe, don't do more than a double batch of custard at a time - do it in a few goes. Sorry for leaving you with lots of egg whites. But meringues are yum! 125g toasted pecans, roughly chopped. Preheat the oven to 300˚f/150˚c. Line a baking sheet with parchment paper. In the bowl of a stand mixer fitted with the paddle attachment, or using an electric mixer, cream together the butter and sugar. Add the vanilla and mix until combined. Add the flour, spices, and salt, and mix until just combined and a dough comes together. Turn out onto a work surface and form the dough into a log shape. Cut slices about 1/2 an inch thick, and place onto the prepared baking sheet with a little space between each. Bake for 35 to 40 minutes, or until lightly golden. Remove from the oven and cool on a wire rack. Store in an airtight container until ready to use. Place the cream and milk in a medium pot over low heat. Heat until you just start to see some bubbles and movement around the edge of the pot. While the cream and milk are heating, whisk together the egg yolks, sugar, brown sugar, corn starch, vanilla bean paste, and salt in a medium bowl, whisking well until the mixture is pale. Once the milk and cream has almost come to a boil, remove from the heat. Pour half of the cream mixture into the egg yolk mixture, whisking continuously until smooth. This tempers the egg yolks to prevent them from scrambling on contact with the hot cream. Return the cream and egg mixture to the pot, and place over a low to medium heat. Add the pumpkin puree, and whisk well until completely combined. Cook the mixture over a low to medium heat, whisking continuously, until the custard has thickened significantly - enough to coat the back of a spoon enough that when you run a finger across the spoon, it leaves a clear track. Place a sieve over a clean medium sized bowl. Strain the thickened custard through the sieve - you may need to do this in two batches. Using an immersion blender, blend the mixture until completely smooth. Place a piece of plastic wrap directly over the surface of the custard, and refrigerate until cooled completely - at least 4 hours. Preheat the oven to 425˚f / 220˚c. Line a small baking sheet with parchment paper. Place the maple syrup, corn syrup, sugar, vanilla, and salt in a small pot over medium heat. Heat, stirring frequently with a spatula, until the mixture is combined and the sugar has melted. Add the pecans and stir until they are evenly coated. Spread the mixture out on the prepared pan. Bake for 7-8 minutes, or until the sugar mixture is bubbling and golden. Remove from the oven, and cool completely before hitting it with a rolling pin or other hard object to break up into crumbs. Store in an airtight container until you are ready to use - use within 1-2 days. Place the heavy cream, maple syrup, and vanilla in a large bowl, or bowl of a stand mixer fitted with the whisk attachment. Whip on medium speed until soft peaks form, then for just a few seconds more - you want it to be just past the 'soft peaks' stage. Place 250g of the shortbread in the work bowl of a food processor. Blitz until it resembles fine crumbs. Transfer to a medium bowl, and add 50g melted butter. Stir well with a spatula until evenly combined. Place 1 1/2 to 2 Tbsp of the spiced shortbread mixture in the bottom of each jar, packing it very loosely with a spoon. (Don't press down too hard or they are tricky to eat). Place the cooled custard mixture into a large piping bag, and snip the end off to form a small hole. Alternatively you can use a large ziploc bag. Pipe the custard into the jars, leaving about 1/2 to 3/4 inch of space at the top of each jar. Bang the jars lightly against the bench to help remove any bubbles. If you are preparing the jars in advance, place them in the fridge until you are ready to serve, then add the cream just before serving if possible. If you need to add the cream, do not add the pecan crunch until serving. Top each jar with a dollop of the vanilla bean maple whipped cream, and sprinkle with a generous amount of the pecan crunch. Happy happy virtual pumpkin party! 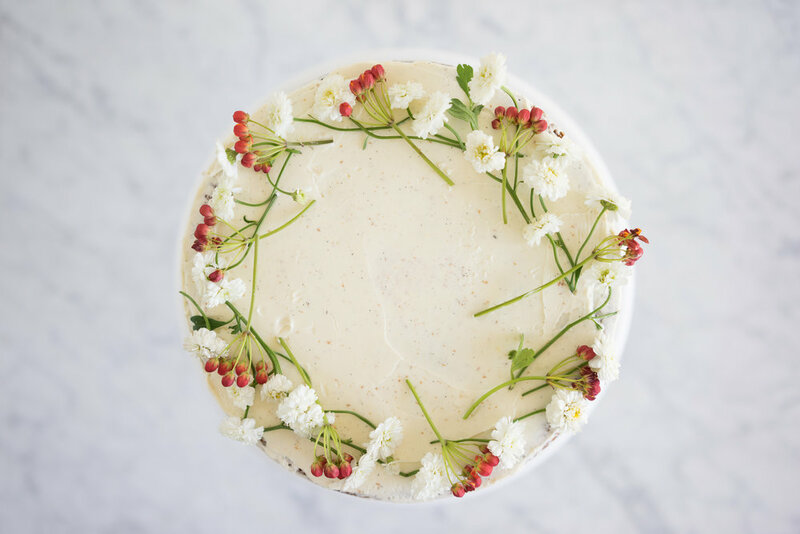 I am so, so grateful to have come across this amazing collection of foodies on the internet! I love knowing that I am part of a little supportive web via my phone or computer, and am constantly blown away by not only how amazing people are, but the raw talent that is out there! The lovely Sara and Aimee were kind enough to organise a virtual pumpkin party this year! A bunch of bloggers all got together and we have all posted pumpkin recipes today. You can check out the full list on Sara and Aimee's sites, and follow along on Instagram with #virtualpumpkinparty! I am so excited to check out everyone's posts! Confession time : Canned pumpkin freaks me out. I don't know why it does, it shouldn't, its no different to ANYTHING else in a can. Haha. Maybe I am just an egg. It doesn't exist in New Zealand. When I was growing up we had an american exchange student staying with us who told us all about canned pumpkin - we didn't believe her, so she sent us a can of it all the way from the states. I don't think we ever opened it. In NZ pumpkin is very much more of a savoury thing - we don't celebrate thanksgiving so pumpkin pie isn't very prolific, we don't have the same obsession with pumpkin spice that America has, and the most common way to have it is either in a soup, or roasted. So I have made my own puree here, but if you don't have a weird aversion to it like I do, (its not you, its most definitely me), canned will work beautifully. With that being said, I have a new found love for sweet pumpkin recipes! I love how the pumpkin stands up against the brown sugar and spices that are added, and this cake is no different. It is a simple pumpkin cake, with a little spice, finished off with a thin coating of german buttercream. German buttercream, unlike its Swiss and Italian cousins, is custard based, so a little less 'buttery' tasting. It goes amazingly with the pumpkin in the cake. 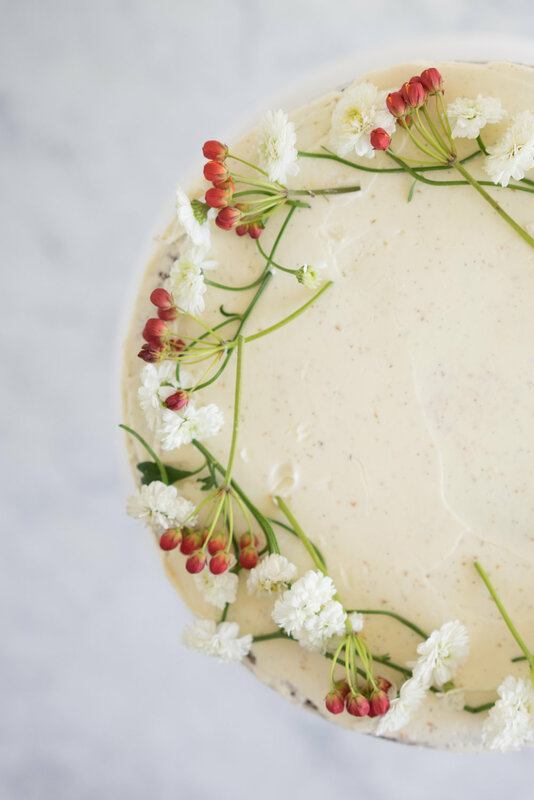 The cake itself is quite moist, so will keep wrapped for a few days in the fridge, making it the perfect make ahead dessert for an autumn or thanksgiving party. You can also prepare the pastry cream/custard for the german buttercream ahead of time, so when it comes to assembling all you will need to do is whip up the buttercream and frost the cake. I have added a recipe for home made pumpkin spice - these quantities make a small jar which is amazing to have on hand. Alternatively you can use a bought pumpkin spice mix. This makes a fairly large cake - if you are catering for less people, a half recipe will fill three six inch pans nicely - but make the same amount of buttercream. Theres nothing worse than not having enough. AND what is a party without presents! The lovely Amy from Aheirloom and I have teamed up to bring you an awesome giveaway, which is double the fun because there are going to be two winners! We are giving away two skinny maple cake stands, same as the one I have used here - one to each winner. 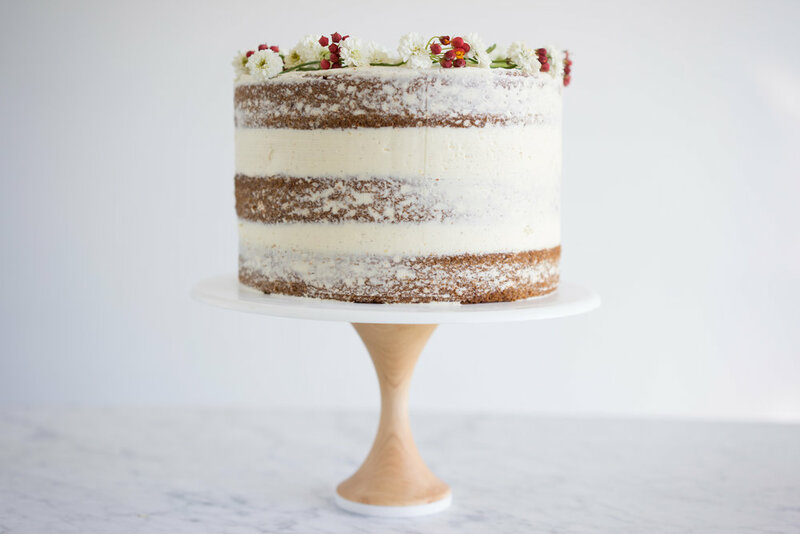 Amy's work is nothing short of incredible, and her cake stands compliment any cake perfectly! 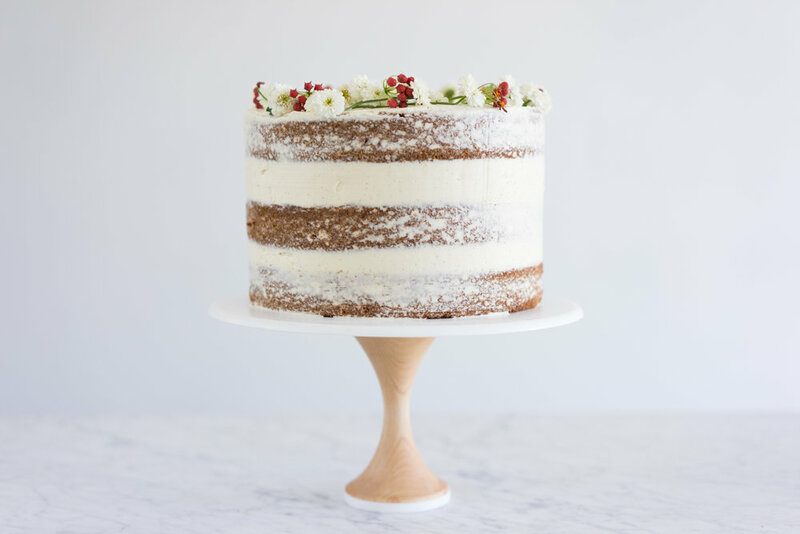 All you have to do is make sure you are following both Amy and I on Instagram, then leave a comment here on the blog post telling us what you would put on a cake stand! The competition is open to US and Canadian residents, and is open until Midnight on the 31st of October. Be sure to leave your instagram name in the comments! Mix all ingredients together in a jar. Preheat the oven to 325f/170c. Grease and flour three 8 inch cake tins. If you are making your own pumpkin puree, add the diced pumpkin to a large pot, and cover with water. Bring to the boil, and boil for 10-15 minutes, or until the pumpkin is tender. Drain, and either mash well with a fork or masher, or transfer to a food processor and blitz until smooth. Cool slightly before using. Measure out two cups - you may have a little left over. In a medium bowl, sift together the flour, baking powder, baking soda and pumpkin spice. In the bowl of a stand mixer fitted with the paddle attachment, or in another bowl, mix together the pumpkin puree, oil, sugar and salt either with the mixer or a whisk/electric mixer. Beat until well combined. Add the eggs one at a time, beating well after each addition to ensure it is incorporated. With the mixer on low, add the flour mixture a third at a time and mix until just incorporated. Ensure that there are no dry parts. Divide the mixture between the tins, and bake for 40-45 minutes, checking for doneness after 40 minutes, and giving it 5 more minutes at a time if necessary. Cool in the tins for 15 minutes then turn onto a wire cake rack to cool completely. Fit your mixer with the whisk attachment. Whip the custard mixture on medium until creamy and lump-free. Begin adding the butter, a few cubes at a time, until fully incorporated. Switch to the paddle attachment and beat for a few minutes until smooth and silky. 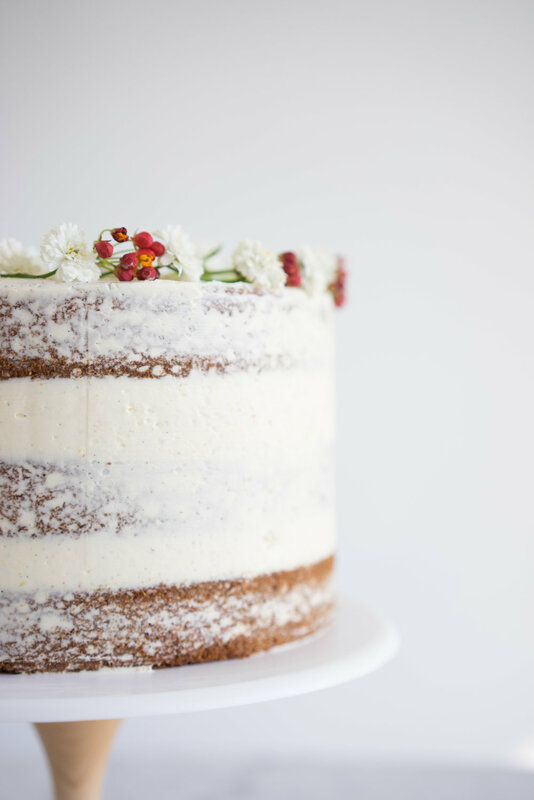 Level your cake layers using a cake leveler or a bread knife. 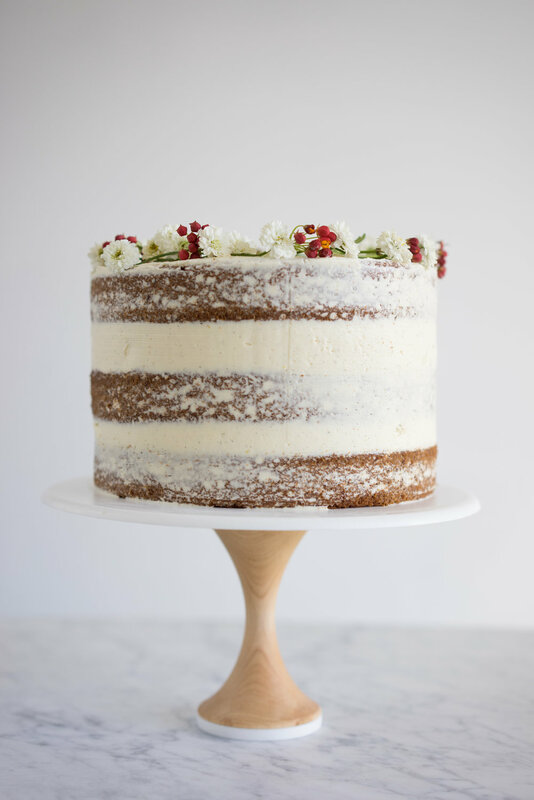 Place the first cake layer on a turntable or cake stand. Smooth a thick layer of buttercream over the layer using an offset spatula. Place the second layer on top, and again smooth a layer of buttercream. Place the final layer on top, ensuring that the edges are straight and aligned. 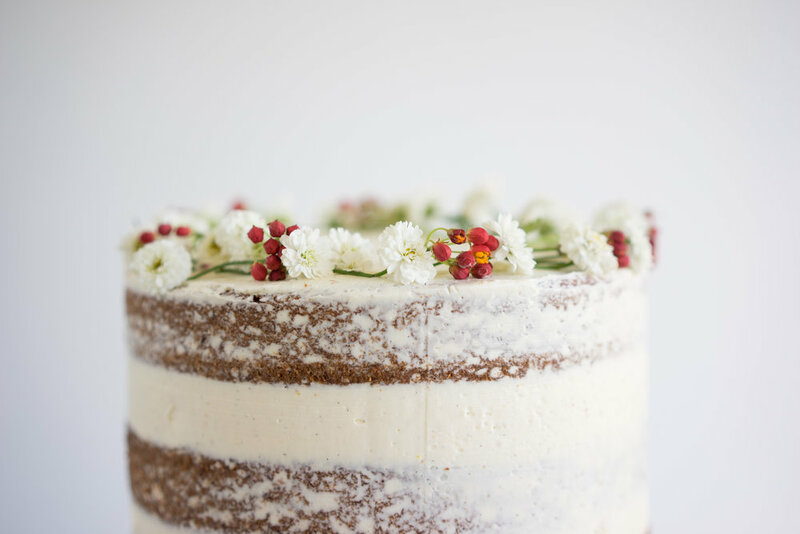 Using an offset spatula, give the whole cake a coating of buttercream, then use a scraper to remove most of it from the outside of the cake to give a 'semi naked' effect. Smooth the top of the cake, then decorate with flowers. Refrigerate until ready to serve. Remove from the fridge an hour or so before serving to allow cake to come to temperature.